I am a community journalist with the mission of reaching the world one person at a time. Caitlin Thornton, Miss Rodeo Idaho 2012, presents the American flag at the Eagle Rodeo in Southern Idaho. She speaks in front of large groups of people. She models, poses for pictures, and partakes in interviews with the media. She skillfully rides, jumps, and showcases horses. She knows the rodeo, has a vision for its future, and loves to reach out to the fans. 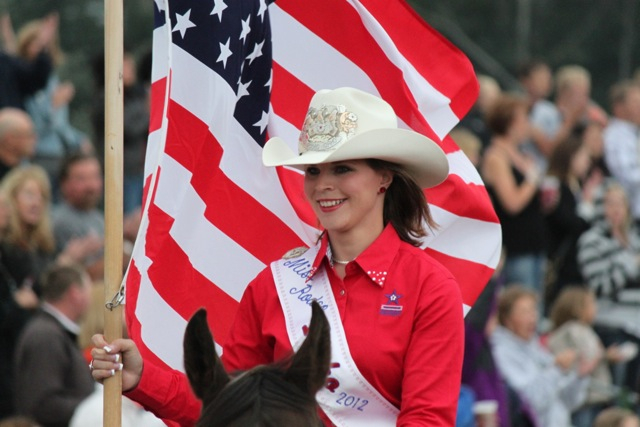 That’s why Coeur d’Alene native Caitlin Thornton was crowned Miss Rodeo Idaho 2012. Cowboys aren’t the only ones who work hard for the rodeo, though. “When I originally won, I don’t think it really sunk in. I had been working since January and it was July,” Thornton said. “So when I put on the banner and the crown for the first time at the rodeo, it fully sunk in that this is what I am going to be doing for the next year,” said Thornton, speaking of her announcement as Miss Rodeo Idaho 2012 in July of 2011. As winner of Miss Rodeo Idaho, she won awards for personality, rodeo knowledge, photography, and horsemanship. As an ambassador of rodeo, Thornton has the opportunity to educate people in the arena of rodeo. Thornton takes pleasure in answering questions from people who have never been to a rodeo. “It’s about being able to transform someone who has never been to a rodeo before into someone who is going to come back and bring family and friends and be lifetime fans,” Thornton said. Mentoring girls is one of Thornton’s greatest missions as a rodeo queen because she relates her past to her present position, using both to reach the next generation of rodeo. “These girls look up to whoever is Miss Rodeo because they want to be her someday. The sport of rodeo and being a rodeo queen cannot continue unless we have a good future to go on to,” Thornton said. Thornton admits her journey hasn’t been flawless. “I’ve been told I walk like a cowboy. Modeling for me has been very hard. I was never at the top. In high school I was in the middle of the pack, but now being at the top of the pack, it’s been very unusual. But now I have gotten used to it,” Thornton said. A schedule for the 2012 PRCA Rodeo at the North Idaho Fair can be found on the above page. “This sport was made for all families to watch and appreciate and enjoy. And what is so great is that this fair and rodeo can bring a family together, for at least one night, “ Thornton said.